As described by Arthur Robinson in is Memorandum and Anecdotes of the Civil War 1862 to 1865, on December 28th orders were read for the 33rd Regiment to return to Memphis. Companies of the 33rd Regiment quartered very comfortably just outside the Memphis city limit until February 7, 1863. 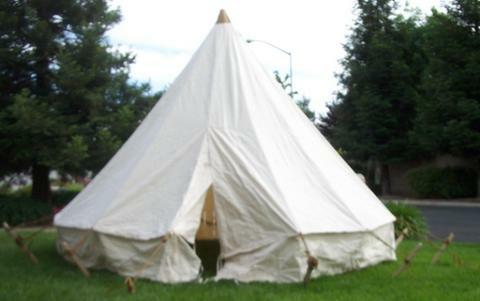 “The morning of February 7th, 1863, we were paid four months’ pay, issued five days’ rations, 60 rounds of cartridges and a sheet of canvas 5 feet by 6 feet, with buttons on one edge and stake loops on the other, so that two sheets could be buttoned together, which we called dog tents. 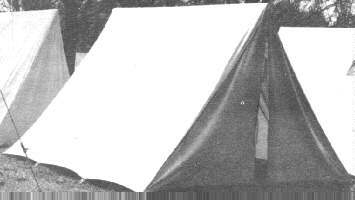 These were to be our tents and shelter. Our quartermaster had been around and taken an inventory of our camp. That meant there was something in the wind. That afternoon, on dress parade, there were orders read to be ready to march to the city landing by 6 A.M., leaving our tents and camp stand. This was not approved by some of the boys.They did not like the idea of leaving our comfortable camp for some new regiment to occupy and enjoy, and there were a good many pranks played, such as splitting the forks of the stakes that supported the bunks, burying blank cartridges in the fireplaces, or stuffing the chimneys with old blankets and castoff clothing; any thing that would be likely to give annoyance to the new occupants. We were in line promptly at 6 o’clock the morning of the 8th, and were marched to the city landing. There we stacked our arms and lay awaiting our turn for loading on the boats. There were three boats assigned for our brigade. (A brigade consisted of 3 to 6 regiments; a regiment was 10 companies of 100 men, so a brigade could be 3000 to 6000 soldiers.) The 3d Iowa and the 41st Missouri were embarked on the White Cloud, a large boat and the one that first brought our regiment to Memphis. The 14th Illinois was next, on the Queen, a stern wheeler; our regiment, the 33d Wisconsin, on the Natchez, a stern wheeler, and we were started down the river in that order, leaving Memphis at 11 o’clock A.M. The third day, as we neared Young’s Point, the White Cloud was fired into by a masked battery from the east bank. We answered with a volley of musketry, and our boat in the rear was ordered to land at a landing a short distance above, the other two going down the river. Our regiment was landed and marched across the bend about two miles, where we came in sight of the battery, two guns. They had spied us and were off in a gallop. Here they had another embrasure and would have given the boats another shot had we not surprised them. We pursued them four miles. We then marched back to Iuca, twelve miles below where we had landed, and found our boats awaiting us there. We were not molested again in our going down the river, and arrived at Milican’s Bend the 12th, where we were disembarked and went into camp. February 13th we awoke in the morning to find our camp flooded with water from the river, everything was drenched, and we were wading out to higher ground, and the boys were singing the nautical song as they marked out. “Mark Twain, Mark above water Twain, nine feet, no bottom.” It was quite amusing to see how cheerful the boys took their wetting. The country is a flat level and protected by a levee, a bank of earth thrown up along the bank of the river. This had washed out or broken in many places, letting the water in. 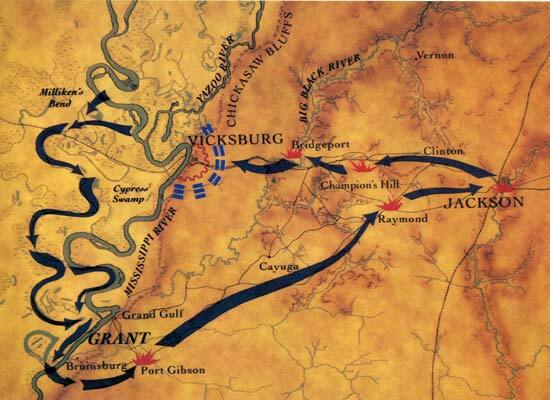 Grant was concentrating his army here and some had already gone below Grand Gulf, on this side of the river. Troops were moving south every day. We were in sound of the gunboats’ fire on Vicksburg. There was a large lot of army stores here, which we were guarding, unloading from boats every day and wagon trains were loaded and sent down below Vicksburg. There was a deserter came to our camp the 17th and reported that there was a rebel camp up the river about 30 miles, near the mouth of White River, where they had a small steamboat and two barges that they were crossing men to the east side with; that their camp was secreted on a bayou entering the White River, a camp of 500 men, commanded by Colonel Gurley. We had received orders to be ready to march at 10 o’clock, issued five days’ rations, 40 rounds of cartridges and light camp outfit, two wagons loaded with picks and shovels and were marched up the river twenty miles, where we apparently go into camp, but only until darkness, when our regiment was divided into two troops. Companies K and I were sent up the river to the mouth of White River; the balance of the regiment was marched west in the cypress swamp over a corduroy road. We moved with great caution. I must here state that our picks and shovels were unloaded at the river, where they were put in array as if we were to work on the levee, ostensibly for a blind, to lead the rebels, if any were spying our movements, to think our purpose was to repair the levee. Engineers building a “corduroy” road.Wood was put down in swampy areas to make a road. We were moving with great caution, probably having gone twelve miles, when we came to a halt, and there one company was detached, turning their ponchos wrong side out over their shoulders. They marched on and we heard them halted by the enemy’s picket. The rebel who had come to our camp was dressed in rebel uniform and was sent up, announcing a friend with the countersign. He relieved the picket and told him that they are on the march to cross the river. This ruse was followed up until we relieved all their sentinels and we stationed our pickets and disarmed the rebels. Then we marched in on their camp and took them totally by surprise without firing a gun. We found their guns stacked and took possession of them before we aroused them. The jig was up. We had captured 400 prisoners, with their entire camp outfit and we guarded them in their own camp until daybreak, when we burned everything that would burn–the two scows and steamboat–and marched out to where we had formed our camp and were back in Milican Bend February 20th in our old camp. The Johnnies were sent up the river the next day. They wanted a boat ride, and they got one. They had been ferrying troops across the river to the east side at night and secreted their boat during the daytime. This had been the source of reinforcements to Pemberton for some time. We remained at Milican Bend guarding the army stores until the 28th of March. That afternoon we were ordered to embark on a boat and with two of the marine boats were sent up the Yazoo River after dark. The fleet ran the blockade that night and the sky was red with shell from our mortar fleet, and the rebel batteries were pouring their shot into our fleet. Our motive was to blow out the blockade in the Yazoo river while the fleet passed Vicksburg, but it was found impracticable, as the rebels had it covered in range of four of their siege guns and were on the alert, and commenced shelling us before we could reach the blockade. They had spies out all along the river. When Company E left Cairo, Illinois for Memphis it was on the packet White Cloud. This is a picture of the river at St. Louis with all the timberclads, steamships and packets loading and unloading troops and supplies. Most of the port cities on the Mississippi looked like this with movement of soldiers and supplies during the Civil War. 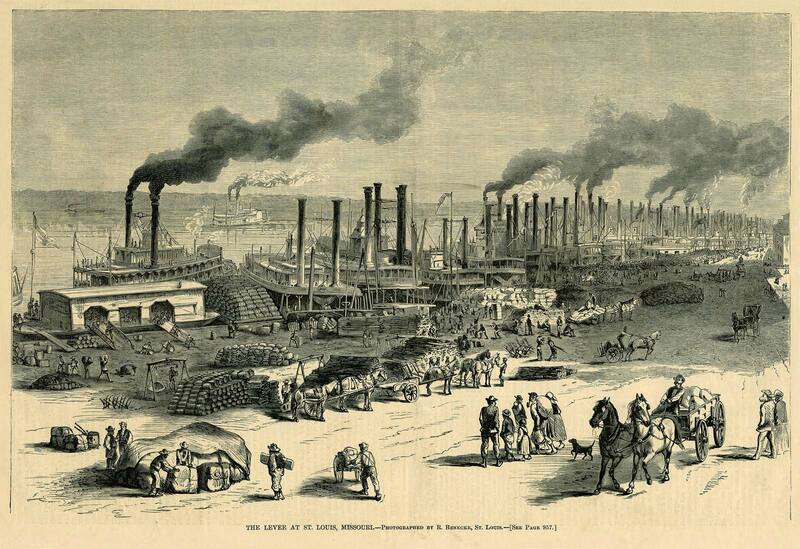 In 1849 a fire erupted at the port in St. Louis and most of the ships including the original White Cloud and about 4 blocks of businesses and home were destroyed. Cost of the destruction was $5,000,000. The second White Cloud was a 345 ton sidewheeler built in McKeesport, Pennsylvania. In 1857 the homeport for the White Cloud was St. Louis. After service in the Civil War the White Cloud was destroyed in an ice squeeze at St. Louis. The 33rd Regiment of Wisconsin Infantry Volunteers were fitted with the Enfield Rifle. It was a musket, with ramrod and bayonet. The writings of Arthur Robinson talk about using either the bayonet or the ramrod to cook their bacon or hold their cup of coffee over the fire to cook. In the words of Arthur Robinson from his Memorandum and Anecdotes of the Civil War here is what the men of Company E faced after the skirmish at Coldwater and on the march to Holly Springs in 1862. 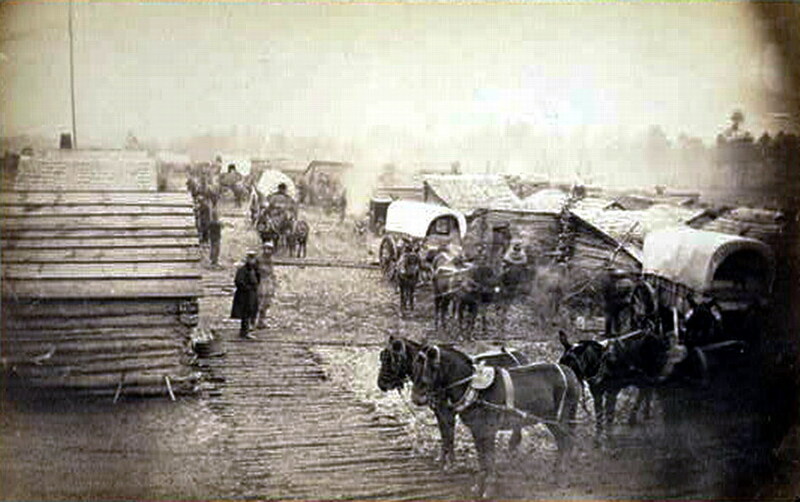 Holly Springs, Mississippi was the camp where Union supplies were stored in Major General Ulysses S. Grants strategic plan to take over Vicksburg. “On December 2d we were ordered to strike camp and be ready to march by 7 A.M.; were issued two days’ rations and cartridges to fill our cartridge box, 40 rounds, with 20 rounds extra, and at 7 o’clock we were on the road, leading south-east toward Holly Springs, Miss. We marched probably fifteen miles that day and camped that night at Pleasant Valley, a large Baptist school on the Tallahatchie river. We had barely gone into camp when the long roll was beat and we hustled to our guns, when the rebel cavalry came dashing in on us, and run right through our camp, but with no great damage to us, only upsetting a few cans of coffee that had been placed on our fires, “one of Forest’s daredevil raids.” We gave them a parting volley as they passed. We had not stationed our pickets when they made their charge, but we gave them a warm reception. This was the first time we had met with such a surprise, and we were a lot of excited boys for a short time, a feeling that is hard to describe, “something like an ague shake.” We soon got down to business again, preparing our evening meal and eating it with as much relish as if nothing occurred to disturb us out of the ordinary. On the morning of December 3d we were on the march by 4 o’clock for Holly Springs. During the night there had been a dispatch by courier that Forest had captured the place and burned the army stores there, and was tearing up the railroad tracks. We were put through on a forced march and arrived at about 4 P.M., to find the place evacuated. They had plundered the camp and torn up about two miles of railroad between Holly Springs and Grand Junction. They had gone in the direction of Grand Junction. Pap Thomas’ cavalry was in hot pursuit. We camped at Holly Springs and repaired the railroad and garrisoned the place. I was detailed for picket duty that night and nearly froze while on my post. It had turned cold, with rain. Our rations were about exhausted and the track torn up. Forest had burned all the supplies at Holly Springs, and the country had been stripped of everything for miles by both the rebels and our army. The 33rd Regiment lost a total of 202 men during the Civil War. 3 Officers and 30 enlisted were killed; 2 officers and 167 enlisted – died from disease. More later on their march to Vicksburg. Edwin R. Squires was born 15 Dec. 1838 in Caldwell, Warren County, New York, the oldest son of Levi Squires and Sabrina Scofield. The Squires family moved to Porter, Rock County Wisconsin in 1845 and Levi Squires is noted as an early settler in Rock County Wisconsin history. To advise my cousins of where they fit in this ancestral heritage. Edwin Squires and Mary Salina Kenyon married 15 December 1858 and had six children. Oldest was Frances Charlotte who was married and remained in Wisconsin when the family moved to Colorado in 1887. Next was Mary Ivadine or “Aunt Ivy” who never married; Harvey Leon; Clarence Delano; Jessie Eugene “Uncle Jesse” who also never married. The youngest child was Grace Irene Squires who married Robert Sidney Foreman. The Foreman’s had four children – Bernard, Mary Francis, Margaret and Robert James. Mary Francis married Bernard Hancock and they had seven children, Grace Evelyn, Pearl, Charlotte and Charlene (twins), Dorothy, Shirley and Robert. My cousins should know the rest of this part of the story. These past few days have been recognized as the 150th anniversary of the Battle of Gettysburg. A major battle, more than 50,000 soldiers killed. A turning point in history for the Union and for the Confederate armies. July 4th is also the 150th anniversary of the end of the siege of Vicksburg. But I’m getting ahead of myself. Let me tell you how Edwin Squires got to Vicksburg. 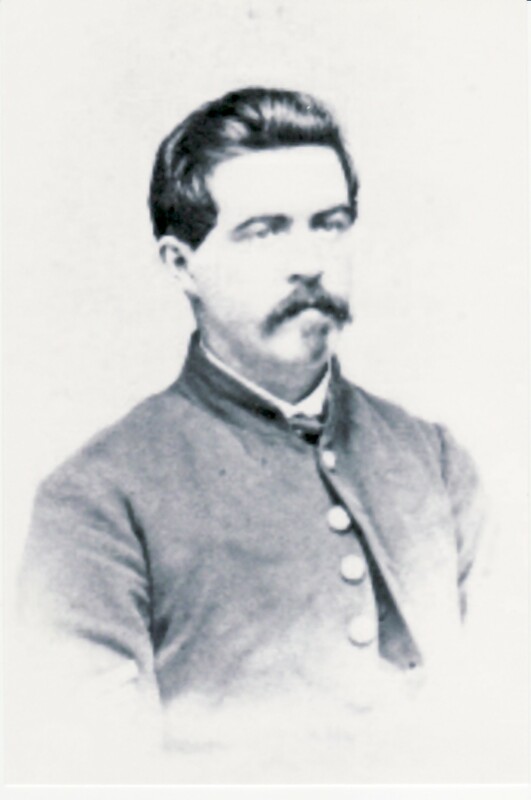 Edwin Squires was sworn in to the Union Army on August 15, 1862, in Janesville, Wisconsin. On the 20th of August they elected the company officers which included Edwin Squires as Third Sergeant. On the 1st of September they were transported to Camp Utley, Racine, Wisconsin on the shore of Lake Michigan, where they were joined by other companies and organized into a regiment of 1,000 men, consisting of 10 companies, and receiving the letter, E Co., 33rd Regiment Wisconsin Volunteers. They remained at Camp Utley for one month, training in drills and camp duty. On the 2nd of October, 1862, they received orders to pack knapsacks and be ready to march to the depot to board freight cars bound for Cairo, Illinois and then by steamer transport on the White Cloud down the Mississippi to Memphis, Tennessee. With the help of the book Memorandum and Anecdotes of the Civil War 1862 to 1865, written by Arthur J. Robinson who served in Company E, 33rd Regiment, Wisconsin Volunteer Infantry I want to give you a snapshot of the experience of these young boys who enlisted to preserve our nation as one. We were delayed until 10 A.M., when the order came to march. There were two brigades and a four-gun battery of 12-pound Howitzers, 1st mountain battery, M, and a battalion of cavalry in the command. We marched out on the Hernando road, camping the first night about 20 miles out from Memphis in a cornfield. It was raining when we went into camp and dark. There was a ten-rail fence around the field, and in a very few minutes we had large fires of pine rails throughout the camp. The boys were busy making coffee in a cup held over the blaze; also frying their bacon on bayonet or ramrod. We had not been in camp but a short time when I was detailed for picket duty and with a squad of 100 from our regiment was marched out a mile south of camp. But quite different were the arrangements to those we had formerly gone through. The sentry was placed stationary every sixty steps and our orders were to watch closely in our front and to call “Halt!” to the least sound, and at second command to shoot, taking no chances from the front of our line. It seemed that we were in close proximity to the enemy by the precautions taken. My dear readers, you may imagine the thoughts of a boy in his seventeenth year, standing a lonely sentry on a bleak, wet night, with the enemy within a rifle shot of his post, and in fact a skirmish line in the early morning, when we exchanged shots, and the bark chipped from the tree at my ear, which was my only shelter. This was my experience the second day after our leaving Memphis, and the morning of the 21st of November we were in pursuit of a detachment of Forest’s army and drove them into their breast works at Coldwater, where we had the river between us and they in a fortified camp. We had proved our mettle in the fight at Coldwater and won the cheers of our old battle-scarred comrades of our brigade. But we had lost five noble officers. Our first Lieutenant, Henry Swift, was killed in the first volley. Captain Lindsley, of Company H, and three of Company A were also killed, and there were 17 wounded in the regiment. Chapter 5 of Arthur Robinson’s book which I will post in a few days takes Company E on to Holly Springs where the boys of Company E will see firsthand the inhumanity of war.